That is the main reason why earth fault of the rotors coil is considered a hazardous regime, and by newest protection standards, it is not allowed to be present for a long period. The principle of work is actually based on the balance of the R-C bridge, like it is presented on picture 1. When there is no earth fault, the equivalent capacity of the rotor and the capacitors Ce is equal to the Cx capacity. The bridge YWX 111 is in balance and the output voltage of the bridge U1– 2 is minimal. When there is earth fault on the rotor coil, the equivalent capacity Ce changes its value and the bridge balance is out of its limits, the output voltage U1– 2 increases its value, and the overvoltage relays IWX 161 start to work and protect the circuit. In the protection concept, there are actually two relays (one is for signalizing the fault and the other one is for demagnetizing and disconnecting the generator). The minimum values for which the protection equipment reacts are: Value of 5 kW for signalization and 1.2 kW for disconnection. In normal mode, when the insulation resistance is in its normal limits, the protection should not work. It is important to note that when we are conducting a routine control on the insulation resistance, we should use a built in voltmeter with internal resistance of 66.7 kW. In case we want to make a simulation, keep in mind that an error will show up, or to be more specific, that error will be (a=DC/Cp ) of 0.06 (6%) for signalization, and 0.41 (41%) for disconnection of the generator. During transition from working to reserve excitation, there is a possibility for bigger error, because the capacity of the excitation system changes its value. In order to eliminate this problem, it is needed to implement an automatic change of the capacity value on the bridge YWX1111, during the transition. In order to test the protection equipment, we connect one regulation resistor of minimum 10W between one end of the excitation and the ground. After that, we decrease the value of the resistor, until we receive a signal for lower resistance of the rotor. For the test, we connect taster in the circuit, so we can test the time when the signaling relay IWX 161 will start working. After that, we continue lowering the value of the regulation resistor, until the disconnecting relay IWX 161 starts working. Some conclusions can be drawn from the previously stated. Although the first earth fault is not a danger at first appearance, because there is no current flowing on the place of the short circuit, it is necessary to disconnect the generator. During the calculation of the protection equipment, the capacitance of the excitation system plays great part. That is the so-called parasite capacitance, which does not have constant value. 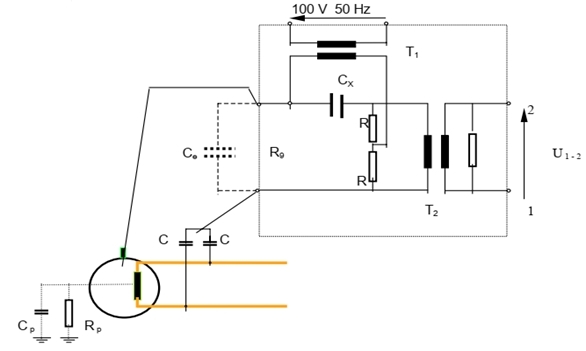 During the operation, it is known that a switch between basic and reserve excitation is possible, but it is necessary during the switch the Cx capacitance to be connected in the balanced bridge, for which the bridge is in balance. This is important because both excitation systems have different capacitances. During the protection equipment checkup, the insulation resistance must be lowered to the minimum value in the shortest possible time. or copy this trackback: http://engineering.electrical-equipment.org/power-quality/earth-fault-protection-of-the-rotor-in-turbo-generator-in-rek-bitola.html/trackback from your own site.